A lively and skilful rover, David Noble was a vice-captain of two North Hobart premiership sides within five years of his senior debut in 1985. By the time of their 1989 triumph over Hobart, Noble’s talent had sufficiently captured the attention of the mainland for him to be drafted, and he was taken by Fitzroy with the 111th selection of the 1989 National Draft, joining fellow Tasmanians such as Mathew Armstrong, Scott Clayton and Alastair Lynch at the club. Noble’s senior AFL debut came on what would become one of Fitzroy’s darkest days – a 157-point drubbing at the hands of Hawthorn at North Hobart Oval in Round 6, 1991 – and he would play only one further senior game before being delisted by Fitzroy. Noble spent 1992 with VFA club Prahran, and the following year took his first steps into the coaching world as captain-coach of Upwey-Tecoma in the Yarra Valley Mountain Football League in Melbourne’s eastern outskirts. Noble spent two seasons at the helm of the Tigers with great success, taking out consecutive club best and fairest awards and guiding the club to back-to-back Division One premierships. These triumphs marked the end of Noble’s playing career at the age of just 27, at which point he retired in the hope of gaining some decent experience in coaching and someday earning a position as a senior coach in the AFL. 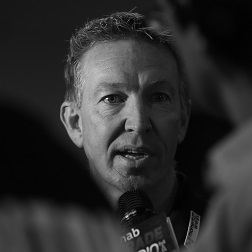 His strengths as an innovator, offensive strategist and opposition analyst helped his coaching credentials to grow, and after TAC Cup stints with the Oakleigh Chargers (assistant coach) and the NSW/ACT Rams (senior coach), Noble was appointed as reserves coach and senior assistant at the Western Bulldogs under Terry Wallace in late 1997. In this capacity Noble led the club’s reserves to a premiership in 1998, and upon the dissolution of the reserves at the end of 1999 he stayed on as an assistant to Wallace until the end of 2002. After an unsuccessful two years at the helm of SANFL side Glenelg in 2003-04, Noble returned to the AFL fold at the start of 2005 as an assistant under Neil Craig at Adelaide. Noble’s stint as assistant coach lasted until 2010 but he has remained at the club ever since, firstly as list manager and most recently as General Manager of Football Operations, gaining widespread respect within the AFL community for his performances in both roles. During his time with the Crows Noble has often been outspoken in his desire for change in some aspects of recruiting, including a restructure of the father-son rule that would see a move from a ‘100 games played’ to a ’10 years served’ system, so as not to disadvantage the sons of talented but injury-plagued fathers.